While growing up, there were only two people in my house who used to cook mutton or chicken in the house, my Grandfather and my Dad. Due to general lack of interest and easy home delivery/take out options, my dad often gave cooking a miss. We would order the Chicken Tikkas, Kadhai Chicken and rarely a Hyderabadi Chicken Biryani. But it was my grandfather (who’s mutton curry recipe one cannot find in any restaurant!) who was the undefeated king of non vegetarian cooking. Who cooks Non-Vegetarian food in your house? I have been a picky eater when it comes to any non- vegetarian but when my grandfather cooked mutton curry, it was like a treasure to be savoured and enjoyed! I thought nobody could beat his expertise. But years later, I was proven wrong by my Sister’s flair at non vegetarian dishes. She is now my go to person on any advice on cooking non vegetarian dishes anytime. 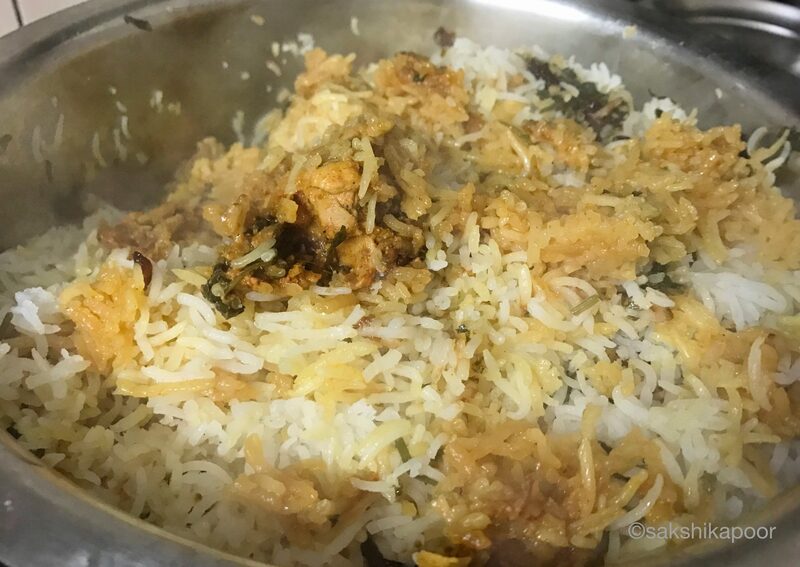 I’m sharing a Hyderabadi Chicken Biryani recipe handed over to me by her that is an absolute sure-shot if you follow it to a T! 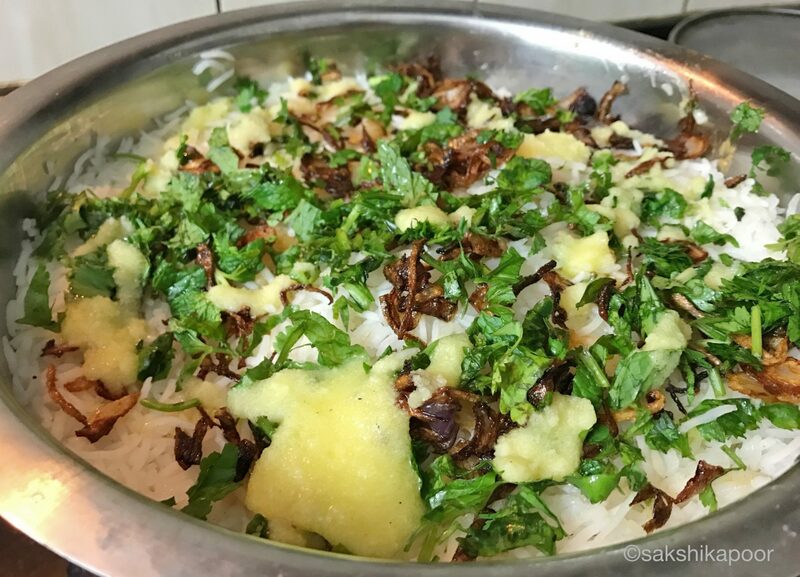 In a recent meeting she showed me how to make this chicken biryani yet again so I could share it on the blog. And what better occasion to share the recipe but on Eid! 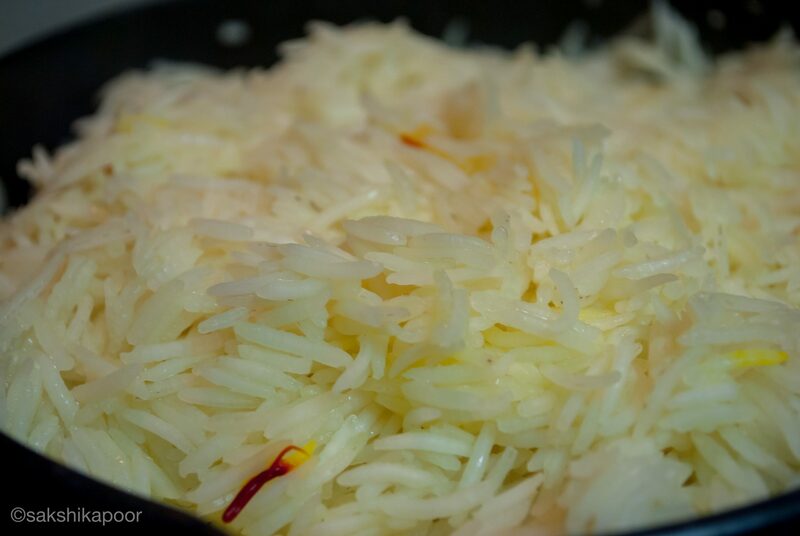 The recipe below yields around 2.5-3 kilos of biryani; enough for a small family! The quantities of spices mentioned here makes the biryani medium spicy/hot. You can adjust it according to your liking of course. 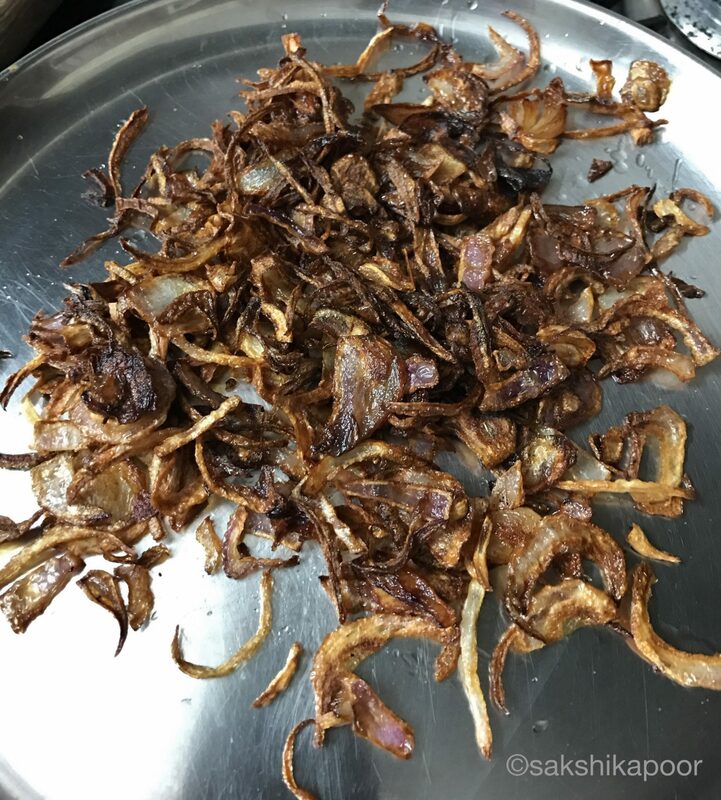 Fry the sliced onions in oil on high heat till the become golden brown. You can do this in batches. You will need to reserve the oil for use later. Crush half of these fried onions to add them to the marinate mix in the next step. Leave some crushed onions for the final layering of the biryani. Add chicken to this mix. You can prick the chicken with a fork before putting the pieces in so that the marinade is absorbed well. Ideally, this marinate could be left in the fridge from 2 hours to overnight. But anything between 2-4 hours would work well. Rinse the rice and fill up the pan with water after the last rinse. Add salt, cinnamon and left over ginger garlic paste in the water and put over medium high heat to boil. 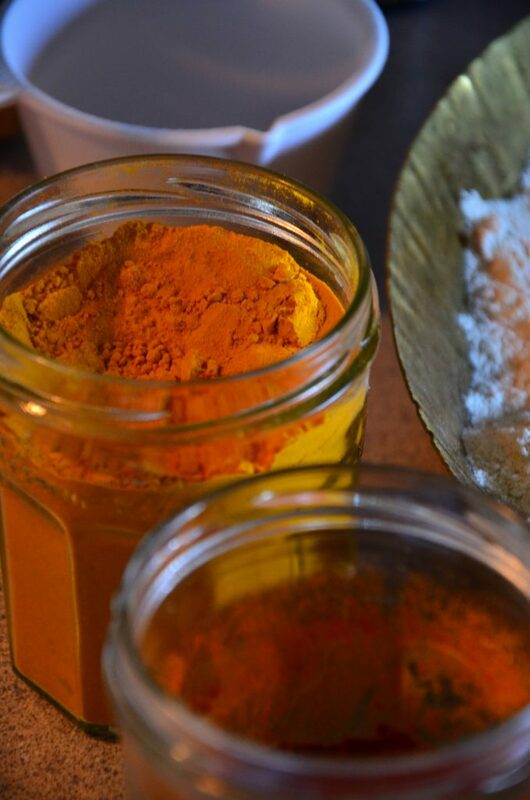 A few strands of saffron can also be added for colour and flavour but it is optional. You need to be attentive towards the rice as we want them only half done. They need to be only partially cooked as they will do sometime on the heat later after they are mixed with the marinate. So check them often by pressing a grain or two between your fingers. The right time is when they look done but are still tough to press. Once the rice is half done, drain the excess water. Put a large pan or wok on medium high heat and add oil. Once hot, add the marinated chicken mix and give it a good mix. Cook for 5 minutes. Now reduce the heat to low and top up the chicken with the partially cooked rice. 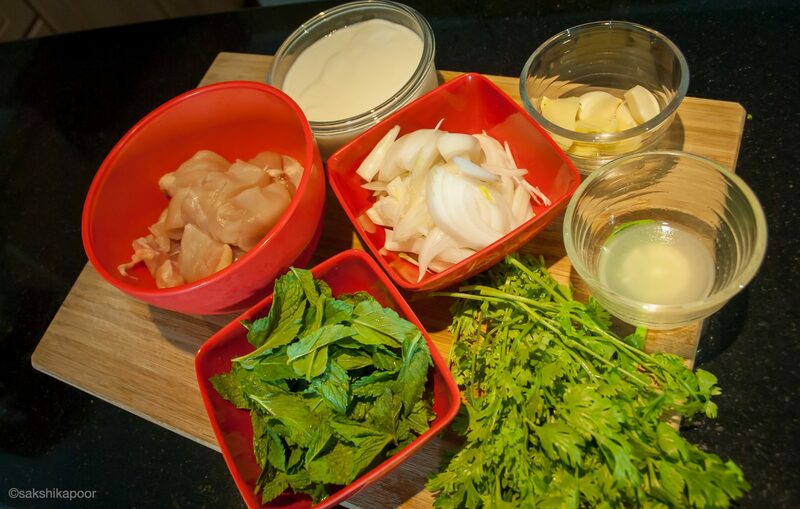 At the top, sprinkle the leftover fried onions and chopped pudina leaves. Add a generous ladle of ghee and cover the pan/wok with a lid. You can seal the edges of the pan with the lid using some dough. Place the pan/wok on a heavy tawa on low heat and cook undisturbed for 40-45 minutes. Remove from heat after it has done it’s time on the stove and open by removing the dough sealing carefully. Mix the chicken and rice gently to not mash the rice too much. Serve this Hyderabadi Chicken Biryani hot with some Raita and onion salad. Enjoy it with family and friends! Thepla- A perfect snack, anytime!